Nyika Plateau National Park is covering around 80 square kilometers in size and is situated in Zambia's Chama District, Eastern province. 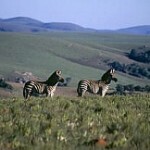 Nyika gained national park status in 1972. 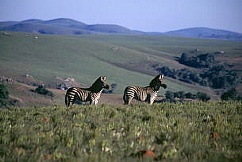 Nyika Plateau National Park is adjacent to the Malawi Nyika National Park with which it shares a common boundary along the international border. Its elevation vary from 1,295 to 2225 meters above sea level, making Nyika the highest altitude park in the Zambian national park system. In terms of vegetation, The Nyika Plateau National Park is a strikingly a beautiful park of montane grassland and relict forest patches. The typical plateau terrain comprises steeply of undulating grassland with forest patches lying in areas of lower ground offering superb panoramic views. Slopes with masses of wild flowers, rolling green hills and green protea bushes, rocky outcrops or kopjes and small tropical forests. Due to the height it is pleasantly warm during the day as opposed to the intense heat of the Valley in early summer. Walking is a delight in Nyika because of the views and the great variety of wildflowers. In October, there are masses of yellow Helichrysums or everlasting flowers, delicate pink and blue Gladioli, Pelagoniums, tiny Hibiscus and orchids like the spectacular blue disa that grows among exposed rocks. Dissotis shrubs give splashes of purple to the rocky outcrops. In November the proteas and giant lobelias come into bloom. The Chisanga Falls are a short hike down through the Brachystegia woodlands with their new spring leaves emerging in rich burgundy colors, reminiscent of autumn. The falls vary from dry season to wet but there's always a good rush of water falling no matter the season. There are small patches of forest with huge buttress rooted trees, yellowwoods, ebony, red-barked Hagenia trees and many others, some of which are draped with monkey vines or Lianas. Often blue monkeys can be heard calling in the woods. The common small animal fauna includes the four striped grass rat, the black and red squirrel, the two-spotted palm civet and three species of swamp rat. The larger mammals include moloney's monkey, klipspringer, reedbuck, bushbuck, blue duiker, zebra, roan antelope, eland and leopard. Bird-watching is excellent all year round at Nyika Plateau National Park but best between October and January, when migrant birds are present. The common birds include secretary bird, auger buzzard, green loerie, white-neck raven, black-eyed bulbul, common stonechart, African boubou, fiscal shrike, common waxbill. Several species of brightly patterned butterflies and moths also occur, which contributes to the colorfulness of this park.